Uncover the science of cooking with this International Association of Culinary Professionals Cookbook Award finalist - Molecular Gastronomy: Scientific Cuisine Demystified Molecular Gastronomy: Scientific Cuisine Demystified aims to demystify the intriguing and often mysterious world of cooking that we call molecular gastronomy, or Avangard Nueva Cocina , as Ferran Adria has called it. This book provides readers with crucial knowledge of the ingredients used to execute the fundamental step-by-step techniques provided and is written to help readers expand their skills in the Molecular Gastronomy area. 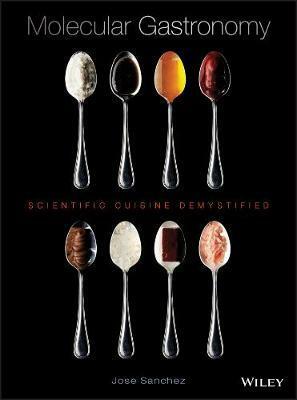 Written by a chef who has spent years cultivating his craft, Molecular Gastronomy: Scientific Cuisine Demystified focuses on introducing the subject to readers and future chefs who have minimal or no experience in the molecular gastronomy of various foods. With its scientific approach, Molecular Gastronomy: Scientific Cuisine Demystified provides a foundation and platform for experimentation, while delving into new and exciting cooking techniques. Stunningly illustrated with hundreds of full-color photos of finished dishes and the process along the way, this unique culinary offering breaks down the science of food while introducing future chefs to some of the most innovative techniques used in today's competitive kitchens. Jose Sanchez, CEC, CHE is currently the executive chef at the Mandarin Oriental, in Washington, DC. Chef Sanchez is a classically trained French Cuisenaire, who developed his unique craft in kitchens located in the far corners of the world. Jose believes that the "essence of cuisine is sharing". He served as Instructor of Culinary Arts at The Culinary Institute of America, and followed that as executive chef for "Iron chef" Masaharu Morimoto. He has also served as an executive chef with JW Marriott Cairo and Dubai. Chef Sanchez is a recipient of various culinary medals for participation in both national and international competitions. He is an active member of the Chaine des Rotisseur, The Societe Culinaire Philantropique, Amicale de Cuisiniere et Patissiere au Japon, and the American Culinary Federation.